(The Hit Squad) 19xx £7.99 ? (The Hit Squad) 199x £2.99 ? 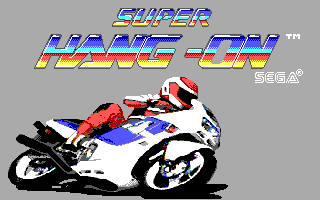 The Western home computer versions of Super Hang-On were released between 1987 and 1989 for the Amiga, Amstrad CPC, Atari ST, Commodore 64, IBM PC, Macintosh and ZX Spectrum. They are all based on the 1987 arcade game, Super Hang-On. In Europe these versions were published by Electric Dreams and in North America, Data East, Software Studios developing most of the home parts bar the DOS and Macintosh versions, which were handled by Quicksilver Software. The Macintosh version is notable not only due to it being one of the few Sega ports to be released on the computer, but because it features a level editor. It is however the least accurate - it does not share the same structure as the arcade version and is controlled entirely by the mouse. It also has no music and the visuals are predictably in black and white. ©1986 Sega Enterprises Inc. All Rights Reserved. ©1986 Sega Enterprises Inc. (USA). All Rights Reserved. Electric Dreams Authorised User. A Software Studios Production in association with Marjacq Micros. Mfd under license by: Data East USA, Inc. Produced By: Quicksilver Software, Inc. Programming By: Impression Software, Inc.
Main article: Super Hang-On (home computers)/Magazine articles.